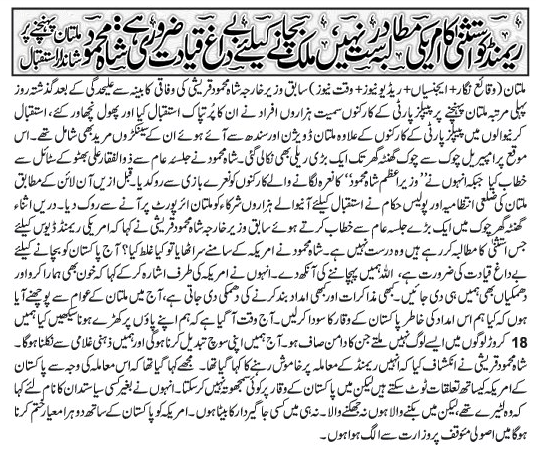 Former Foreign Minister Shah Mehmood Qureshi's speech in Multan reminds me Bhutto, Would he be another Bhutto for PPP? Shah Mehmood Qureshi, seemingly surfacing yet another time to multiply already tainted government's problems, has again voiced grave concerns over Foreign Office's conduct in connection with declaration of Raymond Davis status as diplomat, Geo News reported Friday. He said that he did not yearn to become complainant in Davis case but expressed agreement to speak the truth before LHC if the court felt necessary.